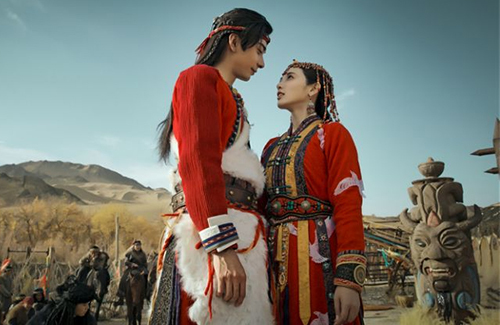 Goodbye My Princess <东宫> came to a tragic end on April 4, when female lead Xiaofeng sacrifices herself for peace between the two kingdoms. The ending stayed true to the original novel written by Fei Wo Si Cun (匪我思存), a story about a doomed romance between two star-crossed lovers from warring kingdoms. Although the tragic ending was expected, many viewers cried in the finale, with some even refusing to accept their favorite characters’ fates. At one point, it was rumored that the production crew created an alternate ending for broadcast, though Xiaofeng’s death remained canon in the end. Nonetheless, as promised in the rumor, the production crew did release a second ending—a three-minute easter egg featuring the two main characters in modern day. In the bonus scene, lead actress Peng Xiaoran (彭小苒) wakes up from a nightmare. Chen Xingxu (陈星旭), who plays the male lead Gu Xiaowu, wakes up beside her and hugs her, promising her that he’ll never let go. The easter egg was warmly received by fans, reaching top trending spots on social media. Many fans were also delighted to hear both of Peng Xiaoran and Chen Xingxu’s original voices rather than their voice actors. After a tragic end, both Xiaofeng and Xiaowu were able to have a happy end in this lifetime. The production crew announced that more bonus scenes will be released, featuring short slice-of-life clips with the main leads as a married couple. Check out the bonus scene below! Sell out. He is probably burning in hell for what he did. Let the ending stand. When did tv shows end with a fanfic? If wanted them to be happy then she didn’t have to kill herself.